Since their introduction, Double Knock Out Roses have gained in popularity among flower gardeners. They are highly disease-resistant and easy to care for, requiring the basics of water, food and weeding. 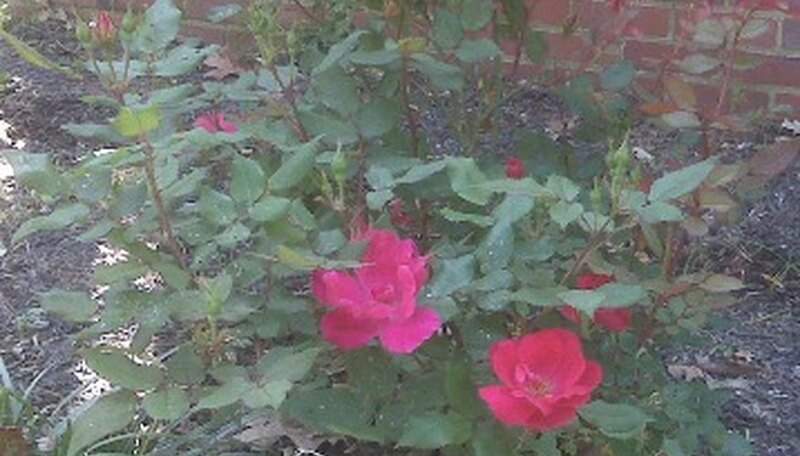 Deadheading and pruning maintains the shape of the rose bush. Water the Double Knock Out Rose deeply about once a week. They need between 1 and 2 inches of water each week. Soaking the soil once a week helps the rose send roots down deeply, which helps it survive drought and extreme temperatures. According to "Ortho’s All about Roses," lightly watered plants are not as robust. Water the rosebush in the morning. Watering a rose during the midday heat can scorch the flower. Flowers watered in the evening may retain wet leaves that make them susceptible to disease. It is best to water at ground level and avoid splashing the foliage. Use an irrigation system such as soaker hoses. These deliver water directly to the soil, which reduces evaporation. Lay the hose in a loop around the rosebush approximately 1 foot away from it on all sides. Soaker hoses can be covered with mulch to hide them. Spread mulch around the rose. Mulch reduces weeds, retains soil moisture and feeds the rose. The mulch should be 1 to 2 inches deep and--with the exception of newly planted roses--should not mound up around the base of the rose. New roses need the mulch mounded over the bud union until new growth (red leaves) appears. At this point, gradually remove the mulch. Weed around the Double Knock Out Rose. Don’t just pull or cut off the top of the weed; use a weeding tool that is inserted into the soil to remove the root. Apply a balanced rose food once a month. It can be organic or chemical. Some rose foods are applied as a spray, some are sprinkled and others are mixed with water and poured around the base of the rose. Prune roses when the bush is older than 3 years. Some people prune in the winter, while others wait until the last frost date. Check with your local agriculture extension office for advice on your area. Remove all dead or diseased canes or canes that are not at least the width of a pencil. Prune the other canes back by a third of their length. Use a wire brush and gently brush the bud union, to remove dead bark from the bud union; this encourages the rose to produce new shoots. Deadhead the Double Knock Out Rose as the blossoms fade. Locate the next 5-leaf set below the faded blossom and cut about 1/4 inch above where the leaf stem meets the rose cane. Hold the pruning shears at a 45-degree angle, facing away from the center of the plant. Clean up rose clippings and throw them away; do not compost them. Winterize your Double Knock Out Rose. Add a layer of mulch or leaves around the base of the bush to help retain soil warmth and moisture through the cold months.